Have you ever tried mentaiko? 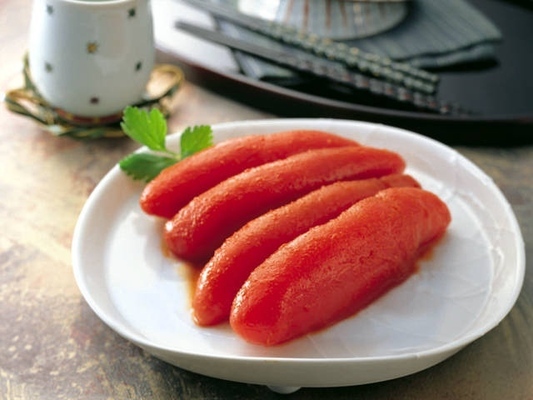 Mentaiko can be translated into Pollock roe in English. You can simply think mentaiko as a salted egg of *sort of* cod. It might be your first time to see and hear about mentaiko if you are not from a culture where usually uses it as a food ingredient. However, it actually is a popular ingredient in countries such as Korea, Japan, and Russia. There are many different types of dishes made by using mentaiko and you will be able to find mentaiko related products like mentaiko mayonnaise and snacks. Fukuoka is usually considered to be a Ramen city to local Japanese people. Everywhere in Japan you will have a chance to find ramen shops but each region has its own characteristics. However, it doesn’t mean that you can try only Fukuoka style ramen if you are traveling to Fukuoka area. For example, there are a lot of Hokkaido style ramen shops in Tokyo and vice versa. Noodles in ramen are usually thin in Fukuoka. There are tons of ramen shops in Fukuoka city including mobile food stalls on the street. The cost totally depends on where you are going to visit; however, at the same time it is actually true that you can have very cheap ramen in Fukuoka. If you are a ramen-lover, I recommend visiting several ramen shops in Fukuoka and find which one is the best for you. 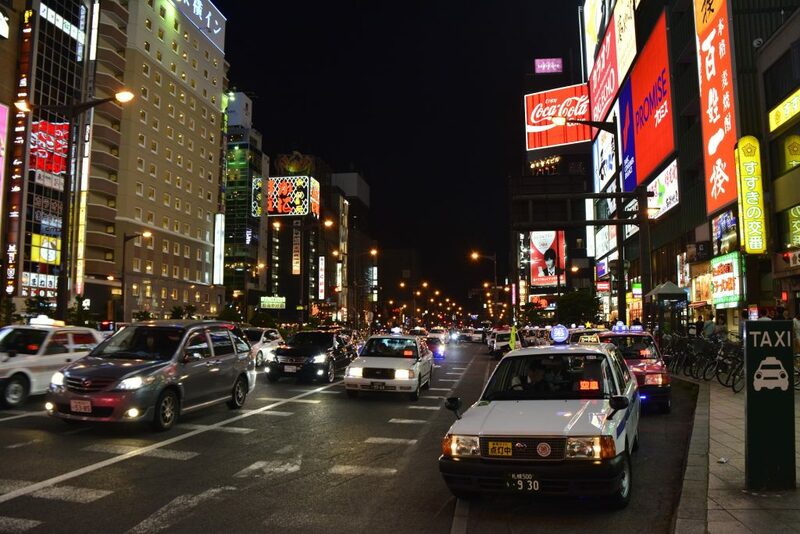 In this article, we will look for some ramen shops(restaurants) in Fukuoka. Though there are always exceptions, many people, especially Asians, want to have smaller face. Well… I would like to say smaller “head” instead. Personally I do not really agree about the strange beauty standard of some Asian countries like Japan and South Korea, which usually applies to female only. However, I also have experience of trying Japanese Kogao(小顔, small face) massage, since muscle in my jaw was troubling me. In my home country I used to take some medical treatments to reduce the pain; however, the situation was not very good here in Japan. Therefore I chose to get small face massage and it actually worked somehow, well, it didn’t make my face smaller though. If you ever traveled to Japan, you might have seen some places look like a game center. There are uncountable machines lining inside the store and people are sitting down in front of it and doing something with their hand. Sometimes you can also see some people have boxes fully filled with small silver balls. So, what is this place for? Why everybody in this place is looking at screen with serious face? Here is a place called as “pachinko”, where you can enjoy Japanese style gambling. Pachinko is a type of recreational arcade game, which is usually considered as gambling device, and it resembles slot machines in Western gambling. Similar to some other countries, gambling for cash is illegal in Japan. Therefore, it is also illegal to directly change pachinko balls to cash. There is a “special” way to change it to money, which will be introduced later on. In this article, we will look for the history of pachinko, how to play it, and how to change balls to money. The biggest holiday in a year, New Year’s holiday is coming soon. I guess this is one of the longest vacations we can have in a year. During this golden holiday, many people plan to travel abroad and make memorable moments with their friends or family members. Of course some people travel alone for achieving their own purposes. Some may want to find what life is while others want to internally grow up by traveling solo. Japan is one of the most popular travel destinations in the world. Every year millions of people visit Japan to experience their foods, cultures, and lifestyles. This amazing country satisfies tourists with both modern and traditional aspects. Even if you are traveling to Tokyo only, which is a capital city of Japan, you will be able to enjoy traditional shrines and temples as well as skyscrapers and museums. In previous article, which was introducing Rishiri Island, I shortly mentioned about Ainu people in Japan. Today, I am going to explain some historical sites where you can experience and feel Ainu people, culture, and their life. The Ainu are indigenous people in Japan, especially in Hokkaido Prefecture, and their culture settled down in Japan a lot in advance than mainstream Japan. The number of officially registered Ainu people in Japan are about 25,000; however, it is estimated that more than 200,000 Ainu people are living in Japan. As I described in previous article, Japanese government, long time ago, thought Ainu culture is not developed and uncivilized. Ainu people have been discriminated by society until now, knowingly or unknowingly, and this made them becoming isolated from living harmoniously with mainstream Japan. This different eyes toward Ainu people made them hide their name, language, and culture. Some Ainu people moved to big city tried hard to live like a mainstream Japanese; however, they needed to come back to their hometown if any other people knew they are actually Ainu. You don’t need any other things but all you need is true Japanese hot springs? You want to enjoy the contrast of freezing Hokkaido weather and super hot spring that can melt your frozen body? Or you focus on relaxing time rather than going out for adventures? 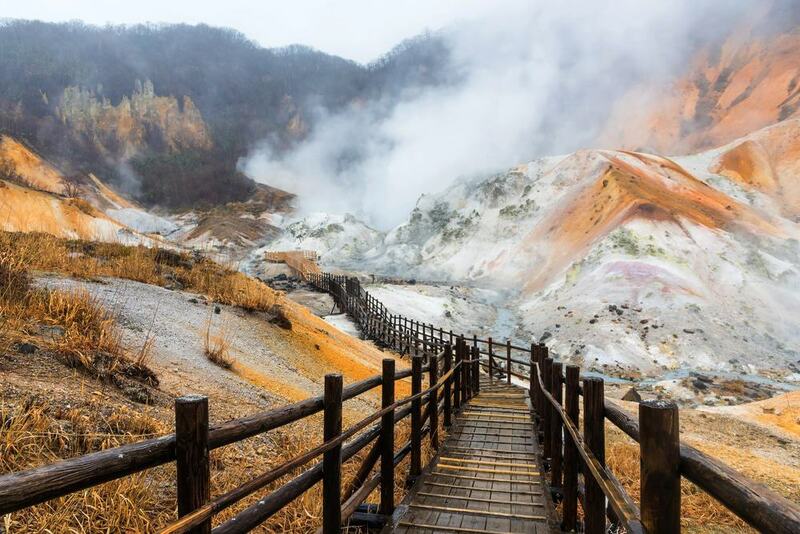 If so, visiting Noboribetsu, which is a city located in Hokkaido prefecture and world widely well-known for its natural hot springs, is recommended. Noboribetsu is one of the most famous and popular hot spring resorts in Japan. It takes only 2 hours from Sapporo so you can make a plan to visit this place if you are traveling to Sapporo. There is a volcanic crater which is called as Jigokudani, menas hell valley in English, and it creates a lot of steam from mountains as well as bubbling hot water. Noboribetsu is also called as Goblin town so that you can see statues of Japanese goblins in some places in village. In addition to this, it is not difficult to see and feel hot steam from onsen. This naturally means visiting here in summer will show you what real humid and hot weather is. Rishiri Island, which is part of Hokkaido Prefecture, means “tall island” in Ainu language. Ainu people, which can be also called an Anyu, are indigenous people of Japan, especially Hokkaido Prefecture and Sakhalin area in Russia. Historically Ainu people are not Yamato clan but from a clan in northern Mongolia. Ainu people had their own language, which is Ainu language, and had a feature of phratry. It is said that Ainu people their own traditional system to make human name; however, nowadays most of them use Japanese or Russian names. Meiji government and society thought traditions and cultures of Ainu were not modern so they banned them to keep their traditions. In addition to this, Ainu people used to live in the wide regions of Japan but government forced them to move to Hokkaido area. 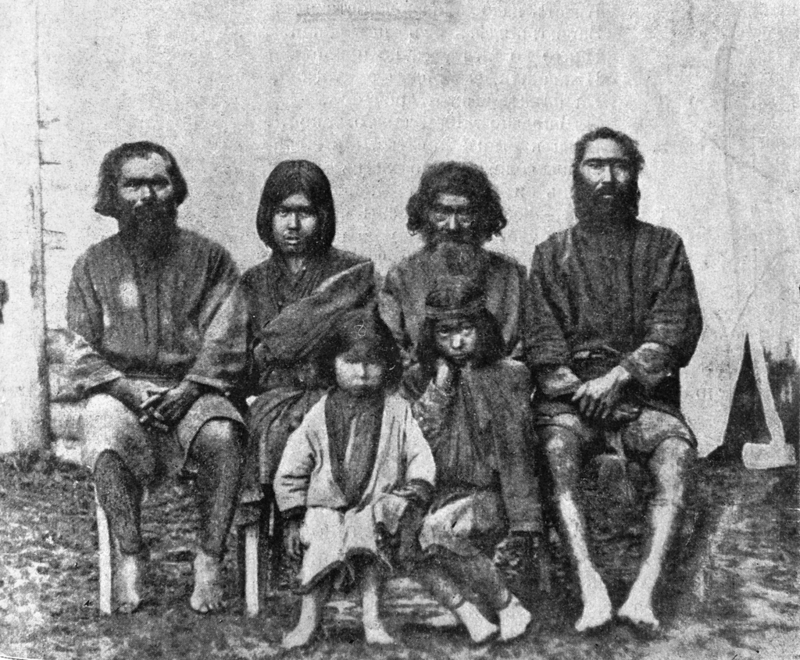 Their own cultures were destroyed and Ainu people had been discriminated for a long time. Nowadays, some Ainu people live in an Ainu village and keep their lives by selling crafts. In my previous article, which was to introduce attractions and things to do in Sapporo, I have shortly mentioned about snow festival(yuki matusri; 雪祭り) in Sapporo. Sapporo Snow Festival is world-widely well known and popular so you’d better not miss this great opportunity to appreciate snow and ice sculptures if you are planning to visit Sapporo during festival season. It is said that the origin of Sapporo Snow Festival comes from the story that some high school students built snow statues in Odori park, where now is used for festival. This happened more than 60 years ago and by now it has developed into a huge annual event. Every year more than 2 million people visit Sapporo to participate in this festival and see hundreds of snow statues and ice sculptures. About 2 hours away from downtown Sapporo by car, Niseko is a town located on the northern Hokkaido Island. There is a famous dormant volcano mountain called Mountain Yotei, which gives perfect geographical features on this area to build ski resorts. Major ski resorts in Japan such as Niseko Mountain Resort Grand Hirafu are located in Niseko so that annually tons of people who love winter sports visit here. There also are resorts where you can enjoy both snow and hot springs. The mountain view from hotels are said to be beautiful, especially when whole trees are covered by snow. If you are staying at high end hotels such as Hilton Hotel Niseko, the hotel provides shuttle bus between New Chitose airport and hotel, which takes around an hour and a half. Even if they don’t know how to play winter sports like ski and snowboard, there still are people who come and stay in Niseko to enjoy its scenery and take a rest.